You might think that creating a custom fireplace mantel would be easy. While it can be a fun and creative experience, there are several features that you should consider when you wish to design your own fireplace mantel to meet your specifications. The type of material used to make your mantel can make a difference in the other types of features that you choose. With natural stone mantels, you are limited in color and texture to what is available with that stone. This can work well when you wish the design of the mantel or the stone itself to stand out. With cast stone mantels, you can create unique color combinations and textures to better suit your personal tastes. You may want to consider color in your fireplace mantel. Some types of natural stone have color running naturally through the grain. Precast stone is able to be colored the way that you wish, so you can enjoy bolder color options, such as greens, blues, and reds. You can choose your own design or carvings styles and combinations when you choose a custom fireplace mantel. You are not limited to what you get with styles such as French Country or British Colonial. 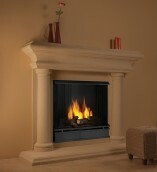 SoCal Fireplace Mantels is a leading provider of custom fireplace mantels in Orange County. If you do not see what you are looking for in available mantels in the showroom, you may speak with a custom design expert to help create a fireplace mantel that will meet your specific requirements.